1) DELUXE: Ask at your hotel who always has an arrangement with a furnace in Murano. They will pick you up and take you in a taxi. You’ll get a grand tour, history & info on making the glass. At the end you will be escorted to the “showroom” where you will get an aggressive sales pitch. Some people enjoy the personalized visit, want to spend a chunk of Euro on glass and they are happy. Others enjoy the tour, but have no intentions of buying. 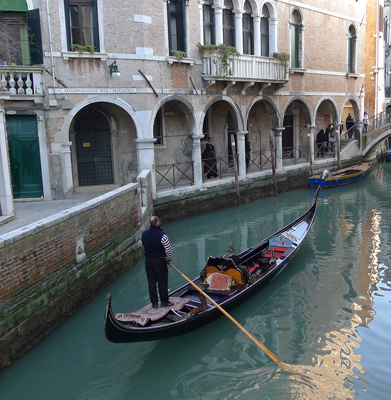 2) DO IT YOURSELF (My Pick): Take the public vaporetto to Murano. Take the 41, 42 or the DM (departs Venices from Piazzale Roma or the train Station only). The 41, 42 take about 40 minutes, the DM about 20. Get off at Colonna (its the first stop on Murano). When you arrive, there will likely be several men (with badges) who will offer you a tour. It’s a short walk with them and you’ll get part of the DELUXE and less of the sales pitch. There will be someone making little horses or animals and it is still interesting. Afterwards you can wander around the islands (yes there are more than one) and maybe catch another tour. Shopping in Venice and Murano: 3 Pieces of Advise. 1) If you see something you love, must have, buy it. Don’t think that you will find it somewhere else cheaper because chances are you won’t and secondly chances are you won’t be able to find the first store again or run out of time and then dream about it forever! 2) If it’s cheap it is not Murano Glass. This goes for jewelry, vases, anything glass. The “Merchants” of Venice will let you think it is. Sometimes they will downright lie to you. 3) Do Not Buy from the street vendors – this means anyone with goods on a bedsheet, selling out of a canvas bag, or lined on the steps of bridges selling purses, toys, watches or whatever the current racket is. You can be fined. It is all fake, meaning illegal. Eating in Venice: First about the food in Venice. It’s a lagoon and their local cuisine is derived from fish and shellfish. Just visit the Fish Market any morning (before noon) and you’ll see the locals buying their daily supplies. The local traditional foods are seppie neri pasta (it’s squid with the ink in the pasta), baccala (dried cod in paste), sarde & soar (onions, sardines & vinegar) and Fegato alla veneziana (liver). The grilled fish is always a good choice and besides it’s healthy. The good news is that the wine, even good wine, is inexpensive. My favorite Prosecco, Carpene Malvoti, is about 6 Euro in the local grocery. In the US, it’s $24.00 plus tax! A cappuccino cost about 1.5 Euro, yes it’s a bit smaller but vastly superior! The other great thing is that there’s no additional tax. What you see on an item is the price, the VAT (equivalent of tax) is already included. Makes figuring out prices a whole lot easier. In Venice, one of the oldest pastry shops is Pasticceria Rosa Salva. It’s a century old and there are 5 in Venice and one in Mestre (mainland). Ask any local and they can point you in the direction. Many tourist, especially Americans make the pilgrimage to Harry’s Bar made famous by Ernest Hemmingway. But for my 50 Euro, nothing beats sitting in the Piazza San Marco (pick any of the cafes with outdoor seating) and listening to the bands, drinking prosecco and just enjoying being in this historical setting with a backdrop of the Chiesa San Marco and the lagoon.